In Amsterdam’s Café Chris, we met a couple of English beer fanatics. 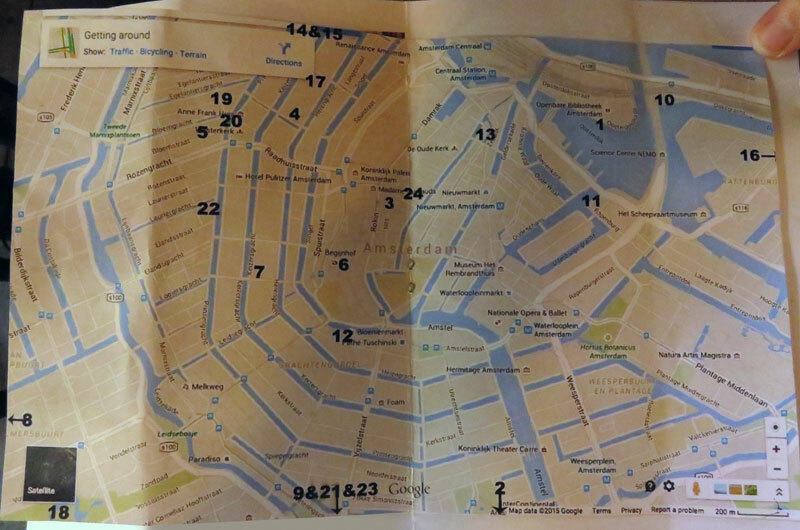 The wife proudly showed off the gift her daughter had made for her birthday: a well-researched guide to pubs in Amsterdam. This has to be the perfect gift for a beer drinker going to Amsterdam. The centre of the book contained a map with the numbers referencing a description of each pub in the rest of the book. This is certainly one way to visit the best pubs in Amsterdam, especially if you know someone who will lovingly put together a book for you. Since we don’t know anyone like that we had to put together our own beer route. While I researched historic pubs with character, Al was researching the pubs with the best selection of beer. And just walking around Amsterdam we came across a number of craft beer brewpubs, along with a well-known windmill brewery that was recommended by everybody we met. Al likes to go to places where BEER is the main focus of the pub. These are the places he came up with. Arendsnest Proeflokaal: A huge selection of Dutch beers along with a stylish interior. Gollem’s Proeflokaal: Not overly attractive but with a good selection of hard-to-find beers, better than average food and a really cute bar cat – all of which make it a winner in my book. De Zotte Bierproeflokaal: a pub specializing in a huge selection of Belgian beers. Pretty good food and atmosphere as well. In De Wildemaan Proeflokaal: Al had chosen it for for its huge selection of beer, and only later did we find out that it was also a historic pub dating back to 1690. Amsterdam’s Brown Cafés are ancient pubs, most of them having been around for eons. I can’t help but imagine I am sharing a pint with the famous painter Rembrandt, or some other character from out of the past! Café ‘t Smalle: Originally a gin distillery in 1786, it is now an atmospheric pub with a good selection of beer and pub snacks. Café Chris: Its 1624 quirky ambiance includes a remarkable toilet flusher. Check it out! Café Hoppe: This Brown Café dates back to 1670, and it even has sand on the floor, a tradition that adds to the authentic historical pub experience. Café Papeneiland: A historic pub from 1642 where I had a delicious meatball sandwich and a Leffe, one of my favourite beers. Stoombierbrouwerij De Bekeerde Suster: We accidentally stumbled upon this brewpub in our search for the Wildeman. All wood, bricks and copper, this modern brewpub had an interesting selection of beers, as well as great Dutch Onion soup. Brouwerij ‘tIj Windmill Brewpub: the windmill brewery that was recommended by everyone we talked to! Pilek Restaurant: head off to the future of Amsterdam at this lively restaurant made out of shipping containers. It has an artificial beach with a great view of Amsterdam across the water, bonfires when the weather is good, a good selection of beer and innovative meals.